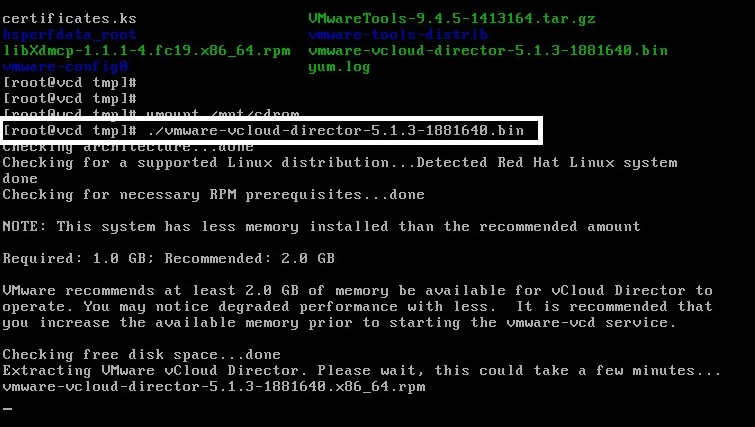 This is part 5 of the vCD Installation guide, describing the installation of the vCloud Director Application binaries upon the RHELS 6.3 OS. 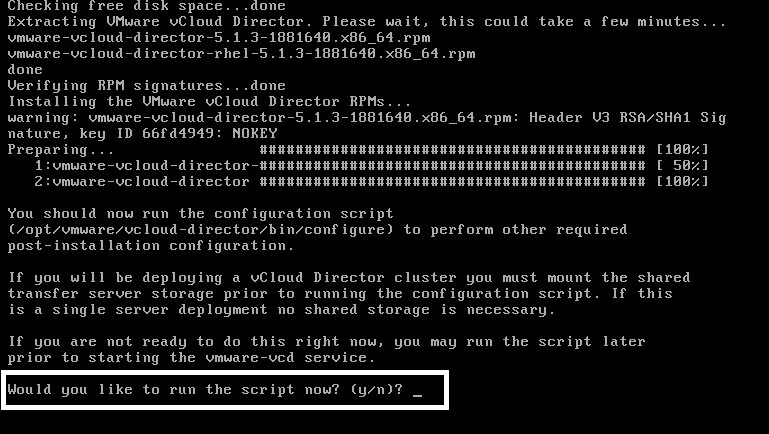 Use FTP or WinSCP to copy the “vmware-vcloud-director-5.1.3-1881640.bin” file to the “install_files” directory. When the question “Would you like to run the script now?” appears, type “y” and press “Enter”. When the message “Please enter your choice for the HTTP service IP address:” appears, type your choice (1 or 2) and press “Enter”. When the message “Please enter your choice for the remote console proxy IP address:” appears, type your choice (1 or 2) and press “Enter”. When the message “Please enter the path to the Java keystore containing your SSL certificates and private keys:” appears, type “/install_files/certificates.ks” and press “Enter”. When the message “Please enter the password for the keystore:” appears, type “123456” and press “Enter”. When the message “Syslog host name or IP address [press Enter to skip]:” appears, press “Enter” to skip or type the Syslog IP address (and then the Syslog UDP port). When the message “Enter the database type:” appears, type “2” and press “Enter”. When the message “Enter the database port:” appears, press “Enter” to accept the default port 1433. 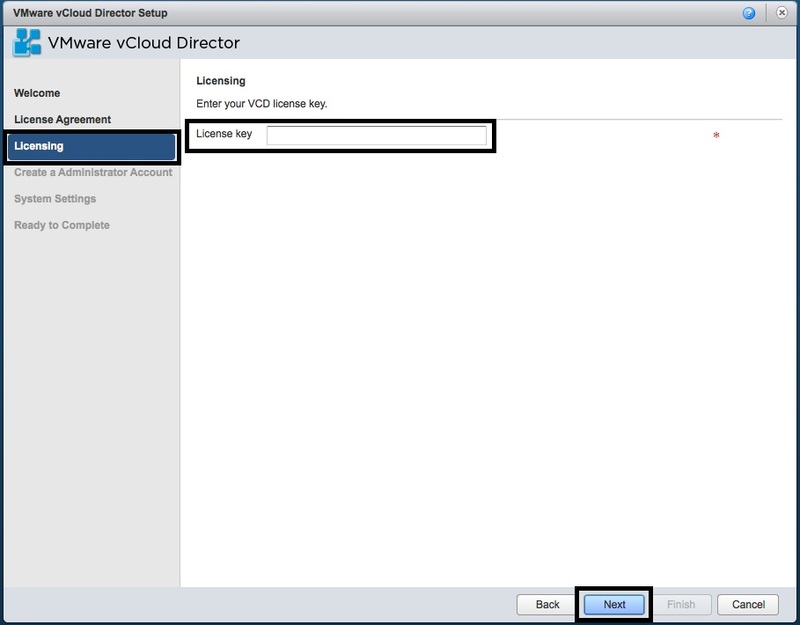 When the message “Enter the database name:” appears, press “Enter” to accept the default database name “vcloud”. 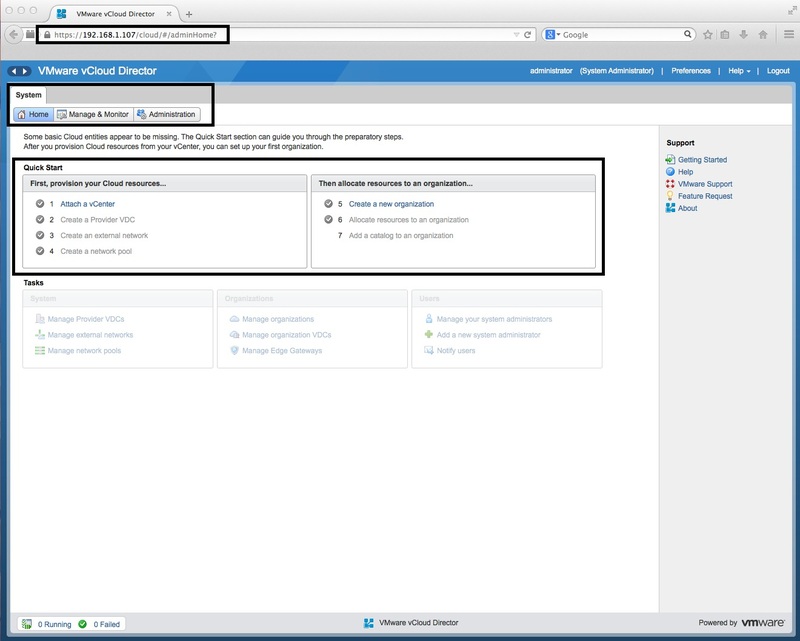 When the message “Enter the database instance:” appears, press “Enter” to accept the default database instance. 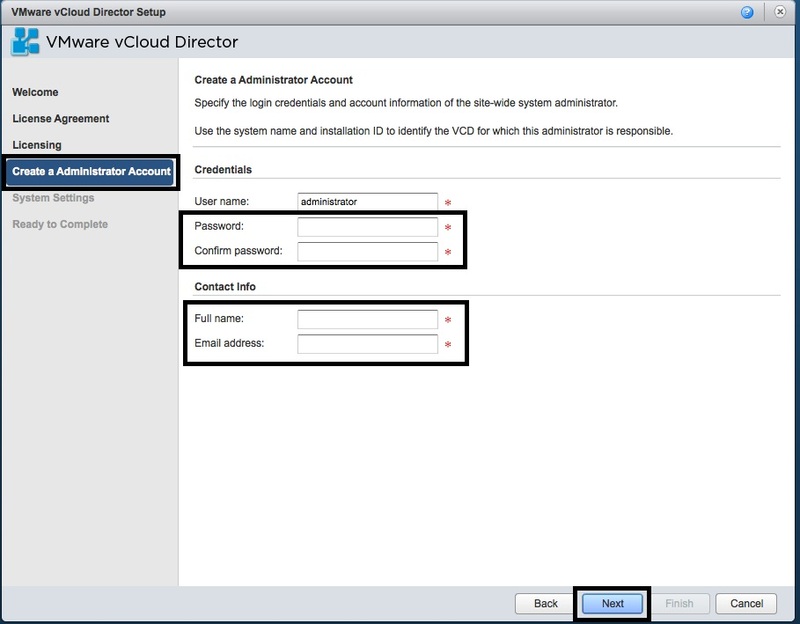 When the message “Enter the database username:” appears, type “vcloud” and press “Enter”. When the message “Enter the database password:” appears, type “@Vmware12” and press “Enter”. When the message “Start it now?” appears, type “y” and press “Enter”. 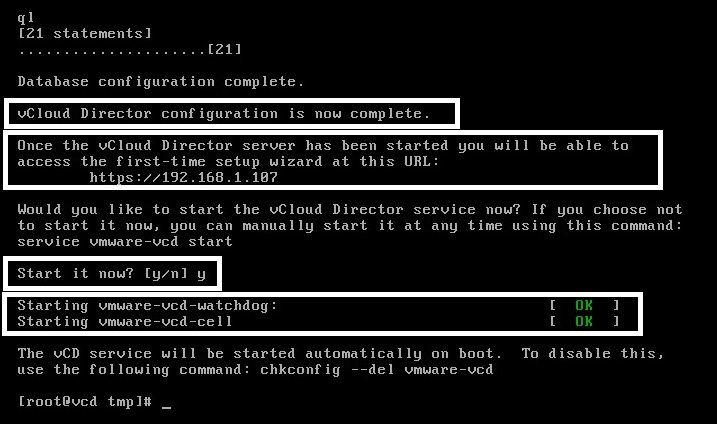 Expect to see the messages “Starting vmware-vcd-watchdog” and “Starting vmware-vcd-cell” and the status “OK” for each. The installation has completed successfully and you will now be returned to the prompt. In the “Welcome” screen, press the “Next” button. 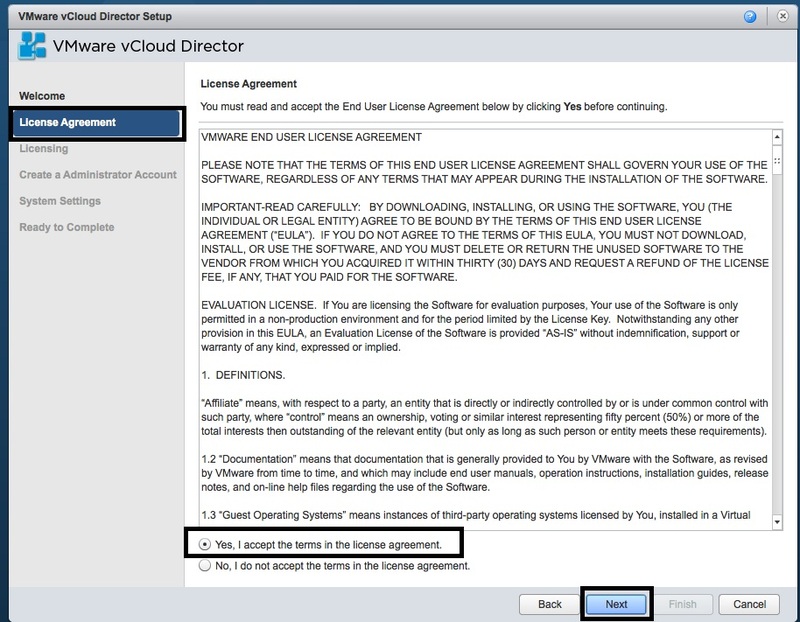 In the “Licence Agreement” screen, select “Yes, I accept the terms in the licence agreement” and press “Next”. In the “Licencing” screen, enter the “Licence key” and press “Next”. In the “Create an Administrator Account” screen, enter the “administrator” “Password”, “Contact info” and press “Next”. 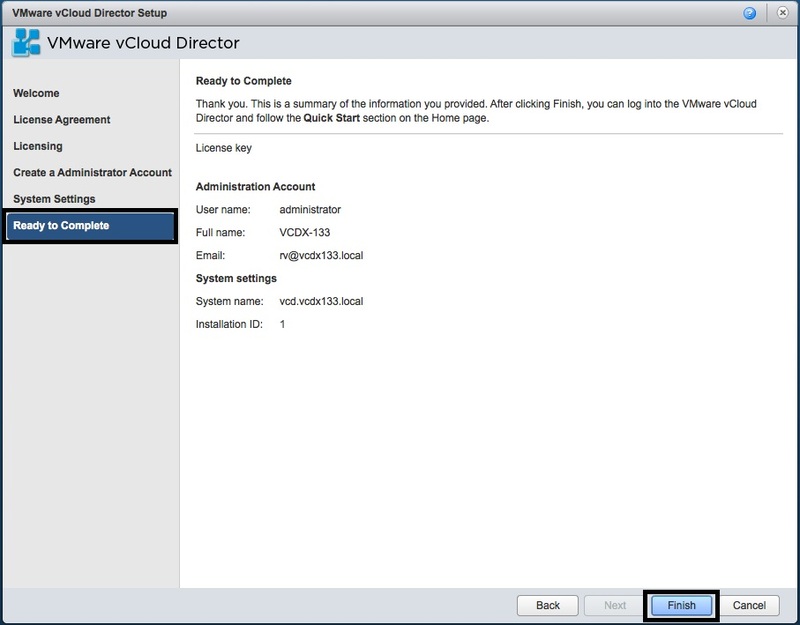 In the “System Settings” screen, enter the “System Name”, “Installation ID” (first vCD Cell – leave as 1) and press “Next”. In the “Ready to Complete” screen, press “Finish”. 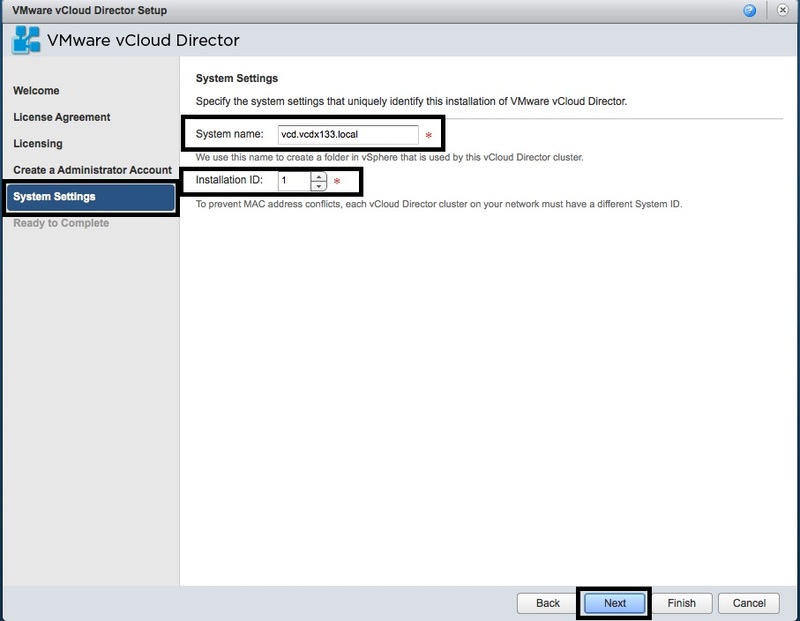 NOTE: vCloud Director requires a vCenter, Provider VDC, External Network, Network Pool, Organisation, Resources & Catalog for the Organisation before you can start providing cloud services via vCloud Director. 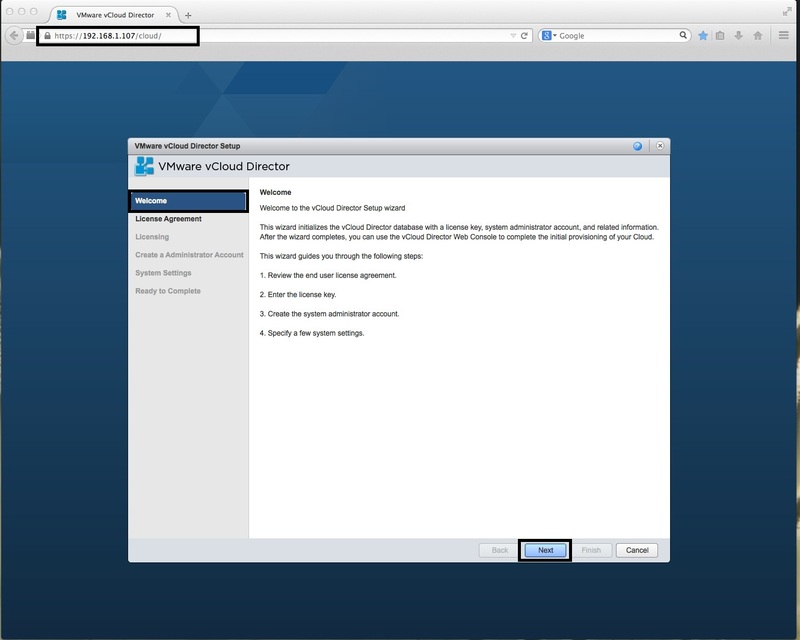 vCloud Director is now installed and ready to be configured.